I’m afraid I’ve caught myself going through the motions of life again. It’s so frustrating when I break out of something then have re-“ah-ha” moment & realize that the mediocrity I’ve tried to avoid has once again emerged. How frustrating. I started this blog because I was tired of wearing a mask. Whether or not anyone read it, I was still putting my heart into writing and acknowledging that even though I am a mess, Jesus has saved me & He remains faithful in my life. I needed to put myself out there in order to heal. If you just put a band-aid on a wound that requires more than that, it doesn’t heal & can even become infected. The Lord told me to be vulnerable with you; to be bold in my proclamation of His promises & to not be afraid of my imperfections & weaknesses. He has spoken gently to me, assuring me that my heart is safe with Him. He has shown me His faithfulness over & over again & has used situations in the past year, situations of both rejoicing and mourning, to show me He does not change. I know He has is growing me. And as He does, He has opened my eyes to different parts of my life that need to change. The word “wholeheartedly” has been popping up everywhere. Does that ever happen to you? A word or verse or concept that keeps showing up everywhere you look? After seeing it a few times, I realized that Jesus was telling me He wants access to EVERY part of my heart so that I can love & serve Him WHOLEHEARTEDLY. I immediately responded with “You do have my whole heart.” But I began to realize that I have had parts of my heart closed so tightly that I haven’t even let Jesus into them. By trying to keep them isolated, I have unintentionally kept Jesus out as well. They are areas that are so dark & overwhelming that I have sealed them up, thinking that if I just closed that chapter & moved on as the new person I have become, it would be all right. But it is not all right. I put a band-aid on wounds that needed more than that. So, sweet friend, if you think about me, would you please pray for me during this process? Some wounds need to be re-opened to be properly cleaned out so that they can heal properly, which will undoubtedly be painful. But I am excited to give Jesus access into every part of my heart & life. I am tired of wincing at the very idea that my beautiful Savior would see how unclean I truly am. I know I can’t hide things from Him, yet I’ve acted like I could. He knows. I know He knows. I think I’ve just been scared of the pain that addressing all of this would bring. But I’m more afraid of not giving Jesus everything I am. That is why I am thankful for the loving guidance He has been giving me on this beautiful & messy journey. I know my heart is safe with Him. I know that He will lead me safely through this. He has always known about these parts of my heart, yet He still loves me! Nothing is hidden from Him, yet He loves me! He is patient & kind. So I am inviting Him to mold my heart to look more like His. It’s time for FREEDOM. Please let me know if I can talk with you or pray for you about anything specific as well. I think it’s so great when we all come together & discuss the same thing. I’ve been really enjoying everyone’s Facebook statuses & Tweets about what they are thankful for. I’ve read everything from, “I’m so thankful for my family” to “I’m thankful for our soldiers”, all the way to “I’m thankful for chocolate…of any kind”. I’m thankful for all of the above! And sure, that last one may have been mine, but I am. No really. I have so much to be thankful for. This year has been amazing. Not without it’s challenges, but amazing. 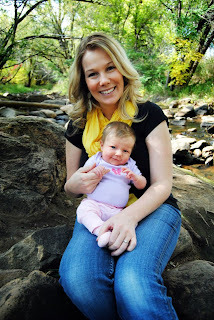 As I write this, my sweet little 3 month old is cooing away in her little swing, just telling me all sorts of stories. Her face lights up when our dog walks by or she hears something familiar. Oh Jesus, thank you for her. She is my heart. Every thanksgiving season I always see Philippians 4:6 at some point. Whether it’s in an email, on Facebook or in a card. I love it. It always reminds me of how my husband & I began learning what true thankfulness looks like during the first year we were married. What an awesome verse. And what a gift it’s been to learn this with my best friend. We went from being thankful for the good days, to being thankful for the good in every day. And there sure is a very big difference between the two! Even in times of pain, uncertainty or confusion, there is always something greater & good to be thankful for. This is not always easy to do & the Lord knows it doesn’t come naturally to me, but I’m thankful that my God is patient with me as I continue to learn & practice this truth. I’m in awe of how He continues to show me what this looks like on a grander scale. There are those of you in my life that have had major tragedy happen and remain thankful for God’s goodness & faithfulness. You bless me & everyone around you. And I’m thankful for the examples you are! I’m thankful for the women who have & continued to pour into my life! I’m also so very grateful for the sweet, peaceful seasons of rest & renewal too! Our God is a good God. He is just as present & in control on our sad days as He is on our happy ones. Above all, I am thankful that God loves us! And I am thankful that His love for us is so great that He offers us the gift of salvation. Freely. No strings attached. Ours forever. All we have to do is accept it! That’s a pretty good deal, right? My God is good. He is my Salvation. And I declare my God as faithful! Ok, so it’s been a thousand months since we’ve talked. My entire world has been turned upside down, sideways and inside out! All in good ways! We had our baby girl in August! Healthy, gorgeous and HAPPY all the time! The first thing I noticed when they laid her on my chest was her eye lids. She has my puffy eyelids. I did that! Wow. That is the coolest thing ever!! Oh, and my nose. I cannot believe that she’s half me and half my husband. And I don’t think it really hits you until you see & hold your baby for the first time. That moment was the best of my life. I’m so passionately in love with her. She has been the PERFECT addition to our little family. She is a symbol of God’s love, goodness and faithfulness. We named her Raelyn because it means “God’s lamb of beauty.” Her middle name is Grace, “God’s unmerited favor”. We knew that’s exactly who she was. My mighty little princess warrior. So be encouraged, as I have been. He is good. Being able to see more clearly that He gives beauty for ashes and joy for mourning has made me fall in love with Him even more. Our little peanut now sleeps through the night and has started allowing me to put her in her swing throughout the day so I can get things done. Like I said, she’s pretty incredible. So, I am looking forward to talking with you more. You are special to me & I have prayed for you during my absence…and sleep deprivation.